A paperback tie-in version for the 1949 movie featuring Alan Ladd. 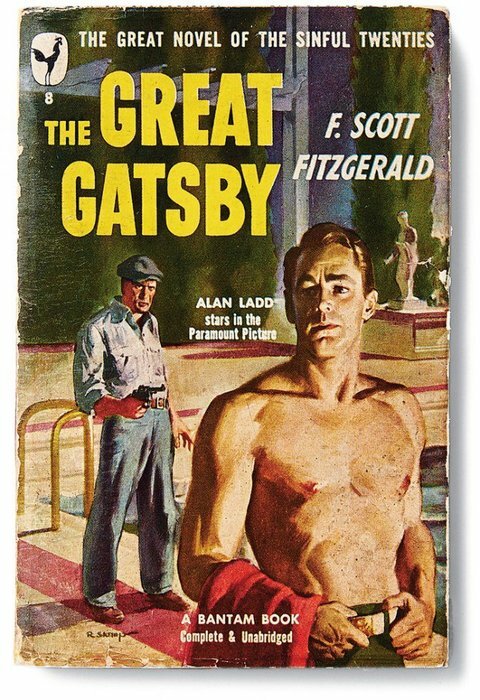 Not exactly how I pictured Gatsby, but there’s no accounting for taste. Wonderful journals from the science-fiction author Octavia Butler. More here. I will find the way to do this So be it! See to it! We internalize all the negative things our culture feeds us about ourselves. We internalize all the negative things our parents (also self-hating) feed us about ourselves. We accept limits that do not exist — or would not if we were not so well prepared to accept them. Strive Always — In All Ways At All Times — Always For Intensity. Cold or Hot, Hard or Soft, Gut-Wrenching or Deeply Stilling Utter Intensity. 33-year-old John le Carré appears on the “Merv Griffin Show,” October 14, 1965. Research to me is as important or more important than the writing. It is the foundation upon which the book is built. I am thirty-six years old. For eighteen years save for a short space during the war writing has been my chief interest in life, and I am in every sense a professional. Yet even now when, at the recurrent cry of “Baby Needs Shoes,” I sit down facing my sharpened pencils and a block of legal-sized paper, I have a feeling of utter helplessness. I may write my story in three days or, as is more frequently the case, it may be six weeks before I have assembled anything worthy to be sent out. I can open a volume from a criminal law library and find a thousand plots. I can go into highway and byway, parlor and kitchen, and listen to personal revelations that at the hands of other writers might endure forever. But all that is nothing — not even enough for a false start. According to an article in the Atlantic, the industrial designer Raymond Loewy had a theory about what makes new products desirable. He believed that consumers are torn between two opposing forces: neophilia, a curiosity about new things; and neophobia, a fear of anything too new. As a result, they gravitate to products that are bold, but instantly comprehensible. Loewy called his grand theory “Most Advanced Yet Acceptable”—MAYA. The theory applies equally to art. I have always believed in studying older stories, even using them explicitly as templates or models, so Loewy’s theory comes as no surprise to me. In fact, there is a sub-genre of how-to books for the analytically-minded looking to write a bestseller. These guides dissect popular novels for common elements — a recipe for success. The latest, called The Bestseller Code, sics a computer algorithm on the data and concludes that my Defending Jacob is #10 on its list of “100 novels our computer thinks you should read.” So it turns out my blazingly original work is actually hopelessly derivative, which, if Loewy is right, might explain a few things.